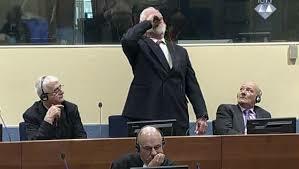 Slobodan Praljak, a former Bosnian general who was on trial Wednesday at the International Criminal Tribunal for the former Yugoslavia, drank poison right in front of the judge at the resumed hearing of his case at the ICC in The Hague. Appeals judges upheld his 20-year sentence for war crimes against Bosnian Muslims during the war in the Balkans in the 1990s, prompting Praljak to stand up and address the court. Slobodan had been sentenced initially in 2013 and appealed his sentence. The entire proceeding and his suicide where all caught on video.